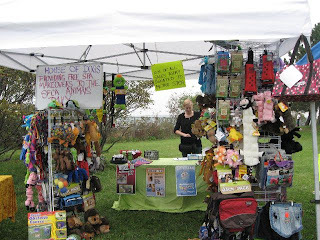 On Saturday, September 25, 2010 from 11-3, the 1st Annual "Bark in the Park" was held at Seaview Park in Halifax. The Bark in the Park replaces the "Dog Jog" that was held for so many years to fund-raise for the Metro Branch SPCA. The forecast called for a mixed bag of weather; we didn't get our sunshine, but at least it didn't full out rain either. The temperature was perfect for the day and especially for the dogs! Brosa, of course, went with me. 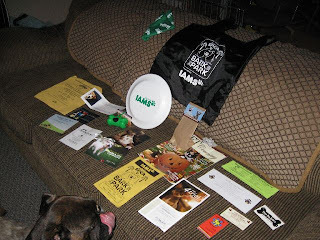 There was live music, snacks, a bbq, a disc-dog demonstration by Lietash Canine Academy (Brosa wasn't interested today, so we didn't take part). Bobby Mac from Q104 FM radio was the MC for the day - he did a great job, and when he wasn't on stage, he was meeting everyone with his own 3 dogs. He met Brosa as well, and seemed quite taken by him. 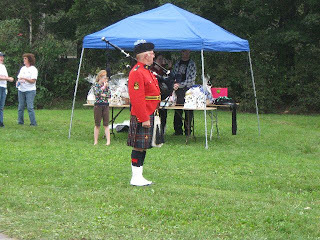 The adorable adoptables started the event as they were led down the path by a piper! 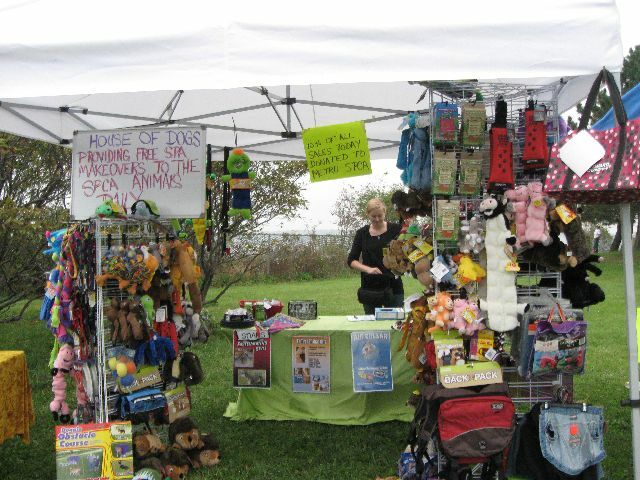 There were many vendors set up, including House of Dogs. Brosa was in heaven here! 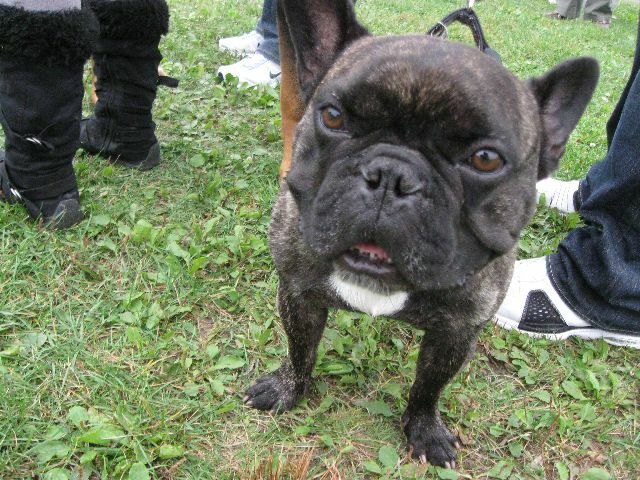 There were dogs of all shapes and sizes, and came in single-breeds or mixed breeds. 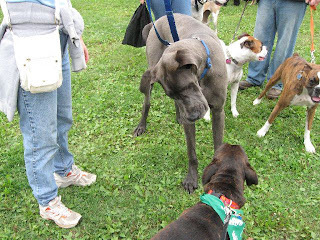 Here, one particularly playful Great Dane adored Brosa. So beautiful - I love the charcoal grey colour of his coat too! This is Lisa Blackburn-Patterson's Wheaton Terrier, Dexter the Wonderdog! This is Pocket, our friend Gail's newest family member. 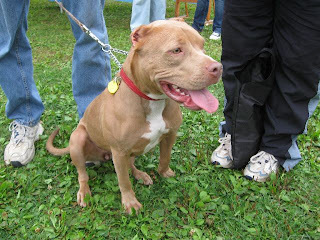 Pocket is a pit-bull-type dog who was rescued from Ontario. Bred to either fight or be bait; she's not dog-aggressive at all and so they planned to breed her. 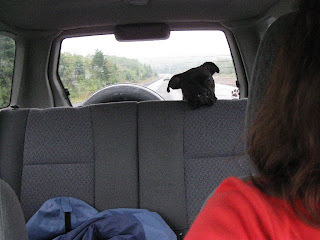 Somehow she was rescued and brought to Nova Scotia. She is only about 7 months old! She will have a fabulous life now, with Brosa as a friend. At the end of the day, we head on home. 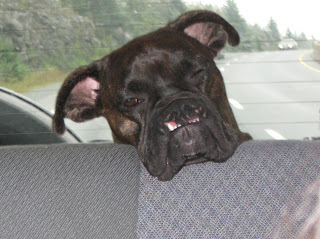 Brosa is a good dog who stays in the back of the car even without a barrier in place. 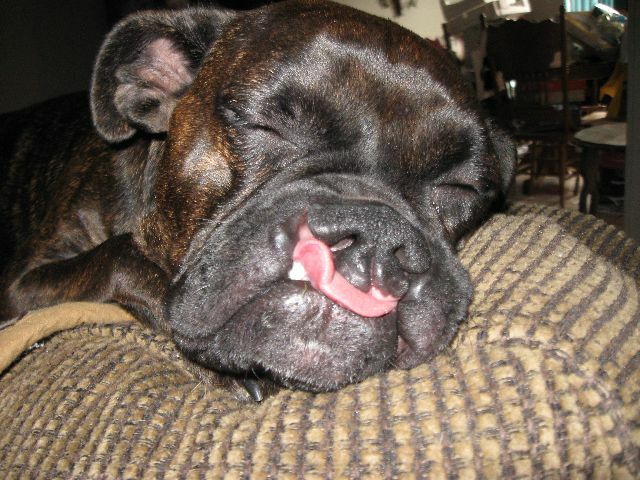 He was struggling hard to stay awake; his eyes drifting off to sleep even while sitting up. His chin is keeping him from falling down, ha ha! This collection was the contents of the swag bag given to participants who donated/collected $20 or more. All in all, it was a pretty terrific day thanks to all of the Volunteers, the SPCA Metro Branch staff, and to all of the vendors and sponsors. 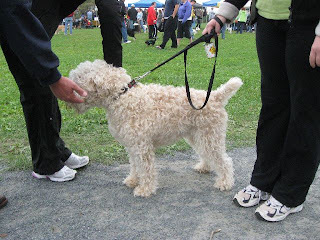 Most especially to all of the participants who brought their lovely dogs to socialize and play. The event raised approximately $22,000 - a phenomenal amount! What a pawsome day! So glad the rain held off! Adore the pictures of a tuckered boxer boy!